Plenty of sunshine and relaxation await you at this upscale 2-bedroom, 2-bathroom Scottsdale vacation rental condo! 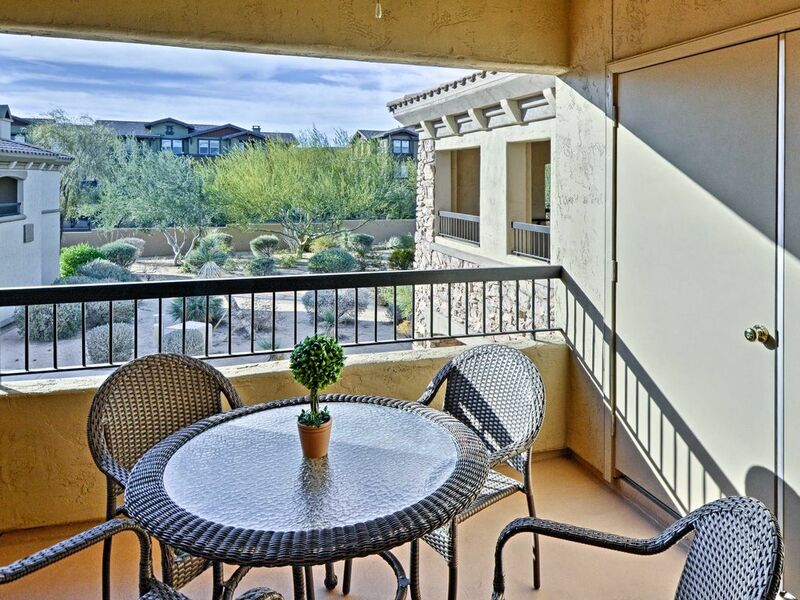 Situated within the pristine Village at Grayhawk complex and offering beautiful open views, this wonderful condo will serve as the perfect home base for 6 guests looking to experience the best of the Phoenix area. Easily go for walks, play basketball at the park, go hiking, shop at malls, and enjoy great dining while staying at this ideally located condo! You'll find the newly remodeled interior of this condo very clean and bright, thanks to several large windows that flood the space with natural light. Prepare your favorite home-cooked meals in the condo's fully equipped kitchen, complete with a dishwasher, microwave oven, toaster, coffee maker, and all the other essential appliances. With enough plate settings and silverware for up to 8, you can enjoy fun family dinners around the adjacent dining area with your companions. Stay entertained during your downtime by watching your favorite cable shows on either the 32-inch flat-screen TV in the master bedroom or the 40-inch flat screen TV in the family room, both of which are Smart TVs. Other amenities provided for your comfort include air conditioning, wireless internet access, and an in-unit washer and dryer for your laundry needs. At the end of the evening, relax outside on the condo's private balcony with your beverage of choice and admire views of the community's lovely desert landscaping. From the condo, you can easily go for leisurely walks to the community park and visit the excellent shopping and dining options nearby. Golf enthusiasts will find multiple golf courses within a 2-mile radius, and outdoor lovers will be within easy reach of Camelback Mountain, just 15 miles away. You'll also enjoy use of the Village at Grayhawk recreation facilities, which include an outdoor community swimming pool and fitness center. - Great Scottsdale location - Close proximity to golf courses, great restaurants, shopping, hiking, Camelback Mountain, and numerous other attractions! Very clean and quiet and just as advertised. We were very happy with all the accommodations and felt like we were at home. Everything about this day was easy and convenient. The owner doesn’t outstanding job and providing information about his unit, the place is fully prepped and is clean and upscale, and the Greyhawk community is very convenient to virtually anything in Scottsdale on North Phoenix. I recommend it highly. Condo was as advertised. Clean, comfortable, well-stocked. Nice pools and fitness facilities. Groceries and restaurants within a minute or two. Loop 101 is relatively close to get around the cities. Lots to do in Phoenix in March (golf, casinos, spring training, NHL hockey games, shopping). Highly recommend this location. P. S. it would be nice to have a barbecue on the balcony versus walking to the pool. unit was in excellent condition, location was very convenient to shopping, great restaurants, and the 101 loop. Very comfortable, with all the features needed for a good vacation. Good pools, with small workout areas. Great place. Well maintained. The apartment had everything included. Great location!